I'm currently recruiting 3 to 6 players (from these boards and a few other forums) for an online Stonehell campaign. EDIT : Recruitment is currently closed. This campaign is meant to be a old-school mega-dungeon crawl based on Michael Curtis' work (please don't spoil the fun by consulting a copy). It is held in my own adaptation of the Twylos setting. I'm hoping to hold a session every two weeks. I'm available on most weeknights and weekends. Each session will be scheduled from this thread as we go along, depending on everyones' availability and time zone. The link for the sessions will be announced on this site. I will privately message you the password to join the game. For the sake of simplicity, it would be better if you use your character's name as a username when logging in. EDIT: Players are expected to visit this thread at least once a week to get the latest news about the campaign. This minimal level of dedication is necessary in order to stick with a biweekly gaming schedule. Disciplines: Armor Use II, Faith Magic Potential, Increased Accuracy I, Language (Drohkan), Literacy, Weapon Mastery I (A). Proficiencies: Animal Handling I (dogs & cattle), Healing II, Local Knowledge II (Malforten), Magic Acuity I, Perception I, Religious Knowledge II, Riding I, Rope Use I, Wilderness Lore I. Equipment: 71 sc, 210 cc, potions of healing (2), scrolls of courage, hesitate & silence and a ring of strength (+2 for 10 rounds once per day). I'm ready to start playing as soon as we have some players. Ah! I'd like to be in this but I am underwater at the moment. This sounds like good times. I've never played over a virtual table before. You will be more than welcome to join in once you surface. Okay, so the questions of character creation shall begin! (Because I'm annoying and ask too many apparently.) Since I don't have the full PDF, what's the "Optional Character Races?" May we use them? I would be eternally grateful if I could pick something of a race other then the general choices. -gag- I've played so many Elves/Half-Elves/Humans that I try to avoid it the best I can. I like being an individual and choosing really WEIRD races to play. I will allow the following optional races if you come up with an interesting character concept, which I'm sure you will. I just don't want to allow optional races just for mechanical incentives (ex. to get a bonus to a certain attribute). In addition to the base Dwarf, Elf, Half-Elf, Half-Orc, Hobgoblin (orc/goblin hybrid), Human, and Orc; I will allow the Cambion (human/demon offspring), Gnome, Goblin, Ogre, Ratkin (ratman), and Reptilian (lizardman). The details concerning the optional races can be found on pages 45-46 of the preview file. Also note that orcs (and therefore half-orcs) are more common, civilized and not as reviled in this setting. New characters get 35 points to spend on their attributes scores (see Table 2.1.1 on page 10 of the preview file) but the easiest way to go about this is to simply pick a pre-generated set (see the link in this thread's first post). Racial adjustments are applied afterwards. Since this a classless game, you get points to buy disciplines (abilities) for your character. You can therefore build your own custom class. Humans get 45 points and other races get 40 points. There is a list (Table 2.1.12) on page 16 of the preview file. Obviously, the disciplines are not all described in the preview file. I'll help you with that. I will also allow the following optional disciplines if they fit your character concept : Arcana, Berserker, Cantrip, Conversational Casting, Forte, Improved Disarm, Inspired, Iron Skin, Jack-of-all-trades, Linguist, Luck, Magus, Natural, Still Spell, Uncanny, as well as the Lesser Faith Magic disciplines found in the 2nd issue of the Wayfarers Guild Journal. Note that discipline points can also be used to buy additional proficiencies (skills, addressed in step 3) but proficiency points cannot be used to buy additional disciplines. The first grade of any of the disciplines can be purchased at 1st level with the exception of Increased Attribute and all of the Spell Circle disciplines. I first suggest that you come up with a character concept. Then, ask yourself the following general questions to guide you in the process : Do you want your character to wield magic? If so, is it arcane (wizard-like) or divine (cleric-like) magic? If not, do you want your character to be more skill-based (rogue-like) or combat-based (warrior-like). EDIT : Added optional disciplines, the Spell Circle disciplines as exceptions which cannot be purchased upon character creation, a list of equipment prices, and the currency system of the Twylos setting. Is anyone else playing yet? Cool, don't hesitate if you have some questions. I'll be happy to answer them. You are the first but I've just started a more "aggressive" advertising phase and it appears to be giving some results. Lets play.... it wont let me open the pdf's says something about a .NetFramework..
What are the Classes available.? Giggles, this is odd, try getting the preview pdf from this page (first link). Wayfarers is a classless system. You can custom-build your own class by buying abilities. All of the standard fantasy archetypes can be easily created. (if not involved in stuff) String III's motto in life is "Run away and Live another day". Interesting character, well done Giggles, you are a fast learner. Equipment: 1 sc, 5 cc, 2 bc, spell book (36/40 pages), lock picks, garrot, knife, clothing, boots, belt, belt pouch, cloak (with hidden pockets), backpack, flint & steel, ink bottle, quills (2), rope (20 ft), candles (4), torches (3), oil flask, bedroll. B comes from a long line of Mystical Antique Collectors full of life and seeking adventure to start his own family lineage. Baldern is more interested in stuff rather than people. Fun going and friendly (if not involved in stuff), String III's motto in life is "Run away and Live another day". EDIT : Added missing information to Baldern's write-up. 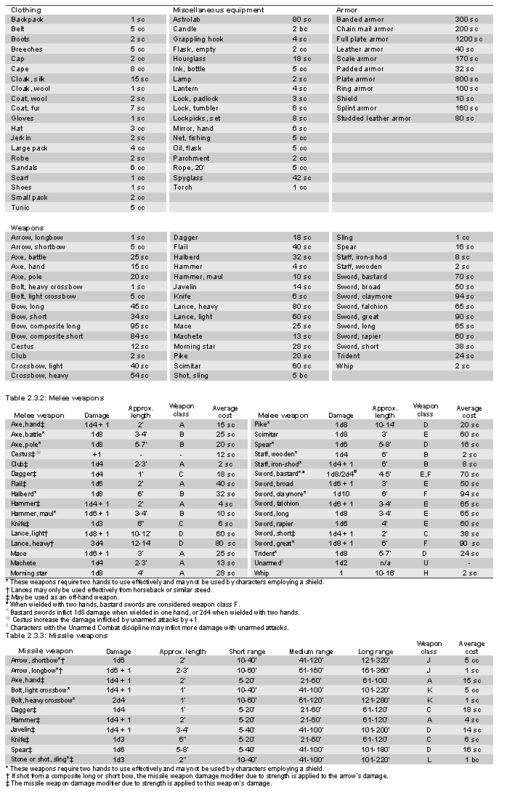 Gnomes receive a +1 adjustment to INT and -1 to STR (I adjusted your stats accordingly), low-light vision, and direction sense but can't use class B, E or F weapons because of their small size. Because of Baldern's high intelligence, he is automatically literate and speaks two languages. I've taken the liberty of selecting the regional language for you but you may select a second language from pages 71-72 of the preview file. The first spell circle is obtained free upon the purchase of Hedge Magic Potential (and you will have to level-up to get the second circle). You therefore still have 9 points to spend on disciplines or proficiencies. By the way, at some point, you might consider buying Dweomercraft (Hedge) should you want your character to be able to research spells and create potions or scrolls. As far as equipment goes, there is a list of weapons and armor with prices on pages 91-92 of the preview file. I'm also asking permission from the author to give access to the price lists for the rest of the stuff. You can also either pick 3 first circle spells and 1 second circle spell (you won't be able to use the second circle spell until you purchase the required discipline) or 4 first circle spells (the spells are listed on page 27 of the preview file). I've already created a token with your character's sketch. I don't have the background story or equipment yet, but will finish up the character once I get back from vacation next week. Giggles, remember that left-over discipline points can also be used to purchase proficiencies. 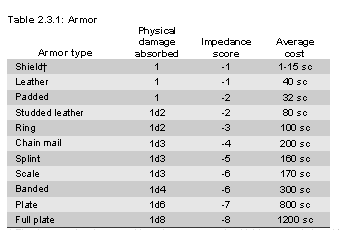 Also, your net impedance is -1 (-1 from STR, -1 from leather armor and +1 from Armor Use) while wearing leather armor. It's not terrible but it does bring a 5% chance of arcane spell failure. Another rank of Armor Use would negate this but it cannot be bought until you level-up. As for the second language, here is the map of Twylos. The game is set in Drohksmere (the eastern portion of the continent), hence Drohkan as a first language choice. You can look at neighbouring regions to choose your second language.